NEW YORK – MAY 8, 2015 – Univision Communications Inc., the leading media company serving Hispanic America, today announced that it will once again celebrate Mother’s Day with a special program, the “Íntimamente… Compartiendo entre Amigas” (Intimately… Sharing among Friends) franchise, co-produced with Televisa and in partnership with The Clorox Company. Guest stars will share their experiences as mothers and grandmothers during the sixth annual special, which will air Saturday, May 9, 2015 at 7 p.m. ET/PT (6 Central). The Mother’s Day primetime special on the Univision Network will feature iconic former talk-show host Cristina Saralegui, TV host Cecilia Galeano, telenovela actress Erika Buenfil, actress Mayrín Villanueva and lifestyle and fashion expert Maggie Jiménez as “Entre Amigas” ambassador. Mexican singer and Latin GRAMMY® nominee El Dasa will perform and surprise the audience with a special guest. This year’s special will be hosted by actress and new mom Cynthia Urias and Univision TV personality Chiquinquirá Delgado, who had her daughters almost two decades apart. It features the fun aspects of the great adventure that is motherhood. The celebrities will talk about the excitement and great moments of being a mom, through the different stages of the experience. Viewers will surely relate to what the celebrities share, from Villanueva, who is raising a blended family of five children, to Buenfil, who is the single mother of a 10-year-old, and Saralegui, who in addition to having three children is now the proud grandmother of three. 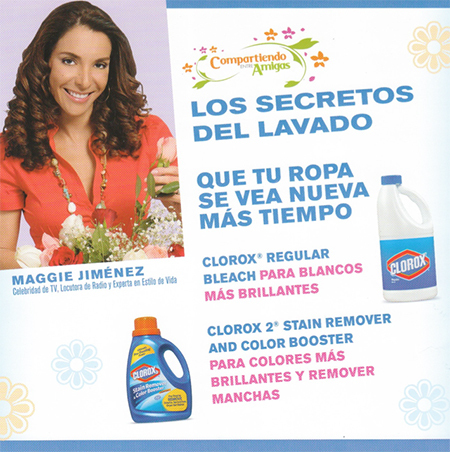 The “Compartiendo entre Amigas” platform, developed in partnership with The Clorox Company and OMD, provides year-round resources and lifestyle tips for Latina women. In addition to its television and radio components, it includes a digital destination, offering U.S. Hispanic women features on family life, couple relationships, parenting, education, weddings, horoscopes, forums and more.